Click image to check the price on Amazon! OK, there is just no way getting around this one. I put this first on the list because it is THE most important of all the items on this page. I seriously think, and wholeheartedly believe, that every trumpet player on the planet sould own this book! This is truly a MUST-HAVE item! This is not only the best trumpet book, it is a legendary trumpet book. If trumpet playing were a religion then the Arban would be the “Bible” and I’m being 100% serious now…in fact the Arban’s book IS called “The Trumpet Bible” in the trumpet community around the world. It does not matter if you are a complete beginner, intermediate or if you are an advanced trumpet player, if you do not own this book it is time for you to order it now. It starts out very easy and slowly progresses and becomes more and more difficult. Trumpet master or beginner…does not matter! Even if it is your first week playing the trumpet, you can… and should use this book, and if you are a trumpet virtuoso, that have been playing for 40 years, you can… and should use this book. …you can find it in the Arban’s. And if you are a beginner hen just start from the beginning of the book as you can not get a more solid foundation than playing from the Arban. 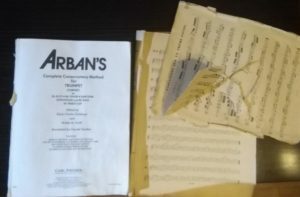 My Arban, and the one I recommend, is the same as the one you can get today, it’s just that the cover has fallen off of my book. This is the trumpet bible. My grand father “Rolf Slotte” bought the Arban book and played from it his whole life and my father continued to use that same book as long as he played the trumpet. …that very book in the picture. And of course the Arban book has been updated several times since it was originally written so, no, it is not outdated trumpet info. It is THE trumpet info. The Arban book and bread on the table! Does your child, or grandson play the trumpet? …get this book as a present for him or her! Are you a comeback player that needs to get the ball rolling again ? …get this book!! Are you a trumpet player that does not yet own this book?…then get this book!!! …it is truly a must-have trumpet item! Where is the best place to order the Arban book? P.S. 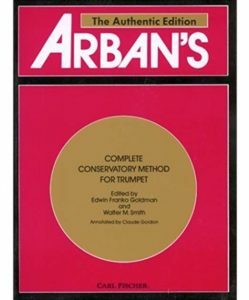 If you decide to order it, the cover of the Arban book can look a little different depending on what edition it is. Don’t worry, they are all the same Arban book. Just order one.